Peter Dutton says refugees would take Australian jobs. PM Malcolm Turnbull has backed immigration minister Peter Dutton, who is under fire for claiming refugees "would be taking Australian jobs" or "languish in unemployment queues". Dutton made the comments on Sky News on Tuesday, responding to questions about the Greens' proposal to boost Australia's refugee intake to 50,000 per year. "They won't be numerate or literate in their own language, let alone English," Dutton said. "These people would be taking Australian jobs, there's no question about that. "For many of them that would be unemployed, they would languish in unemployment queues and on Medicare and the rest of it so there would be huge cost and there's no sense in sugar-coating that, that's the scenario." Responding to Dutton's comments, Turnbull praised him as an "an outstanding Immigration Minister" and cited the government's record on boat arrivals. "[Many refugees] are from dreadful, devastated, war-torn regions of the world and many of them, large percentages of them have no English skills at all. Many of them are illiterate in their own language. Many haven't completed high school. That is no fault of theirs," Turnbull said. "That is why we are reaching out to help them with compassion. What we do, in a way that many other countries do not, we invest $800 million a year in ensuring they get the settlement services they need so they learn English, so they are integrated into our society. That is why we are the most successful multicultural society in the world. Our immigration program is built on a pillar of compassion which means that we take the refugees and their needs seriously and we invest in them." "Many of them are illiterate in their own languages. That is no fault of theirs. That is not a basis for criticising them. What it is, as Peter as identified, is a basis for us taking our responsibilities seriously and ensuring that we take into Australia the number of refugees that we can effectively settle," the PM continued. Foreign Minister Julie Bishop cautiously backed Dutton's comments on Wednesday, citing the high costs of resettlement and easing new arrivals into the community. "Peter Dutton is pointing out the very real cost involved in issuing humanitarian and refugee visas," she told Sky News. "Often the people who come to Australia on these visas are from very troubled backgrounds, particularly from Afghanistan but also Pakistan and beyond, and there is an extremely high cost involved in ensuring they can be a contributing member of society." Greens immigration spokesperson Sarah Hanson-Young railed against Dutton's comments in a stream of tweets, calling for Prime Minister Malcolm Turnbull to explain or condemn his minister's views which she called "xenophobic". A Labor spokesman told Fairfax Media: "These are deeply offensive comments and Mr Dutton should immediately apologise for these half-baked remarks". 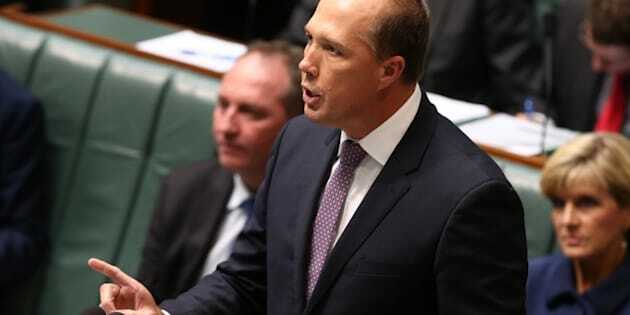 "This country has a proud tradition of multiculturalism and for Mr Dutton to make such narrow-minded and xenophobic remarks exposes the right-wing brigade behind Malcolm Turnbull." Labor immigration spokesperson Richard Marles also added to the backlash, calling Dutton's comments "political dog whistling" on the 7:30 Report on Wednesday night. "What we saw last night was politics of the most rank kind on the part of the Immigration Minister and ought to be condemned," Marles said. "That was an indiscriminate spray which I think we all understand what it was about".